Spain - a wonderful European country where you can not only relax, but also to live, work and do business successfully. The country has a high standard of living, a strong economy and a stable political situation. Spain attracts with its architectural monuments of the Middle Ages, and the coast delights with its magnificent resorts designed for families with children. The most familiar type of real estate for the country - houses and villas, and apartment complexes can be found in most major cities. Places to search for property on the coast of the country are a lot, for example, you can look in the resort of Benidorm in Costa Blanca. Properties in Benidorm - qualitative and perspective. And the city is the center of coastal entertainments. The Costa Blanca has the longest beach season. The ecology of the region is high, so there are so many beaches awarded with "Blue Flag" for cleanliness. All the beaches in Benidorm have received this award - there are three of them in the region with a total length of 5 kilometers. They are so magnificently equipped, that are considered the best in Europe - there is even a library there. Each of the beaches can be easily reached by a car. There is an active nightlife in Benidorm - almost like in Ibiza, so you do not have to be bored. But if you want peace and quiet - the quiet parts of the city, away from the bustling waterfront, are at your disposal. You can take a stroll in the park or in the mountains too. The city also stands out against the background of the Spanish resorts with its high-rise buildings. The city buildings are included in the Top 20 of highest in the country. 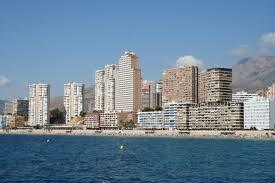 The tallest building in Benidorm is 200 meters. Decent apartment from the owner in the town costs less than 100 thousand Euros - prices of properties are quite affordable, especially if they are not on the first line. Having bought a house in the city, you will ensure yourself a permanent lease and a profitable resale.